Lord Terryr watches the Earth from his castle on his asteroid. Master of the Army of Horroriors, Terryr wants nothing more than to sow chaos among humankind and create fear. His ultimate goal? Nothing more than the ultimate downfall of society on Earth, to scare humanity back to the stone age, leaving on only a superstitious, easily controlled population behind. I don’t have much to say about Lord Terryr here. I mostly just wanted to draw a weird looking villain who would rule an army of monsters. I admit I’ve not seen a lot of Power Rangers, but the idea of sending monsters down to Earth is something I know they had, but here those monsters are only there to cause fear, not to conquer the world or whatever. This seems more feasible. 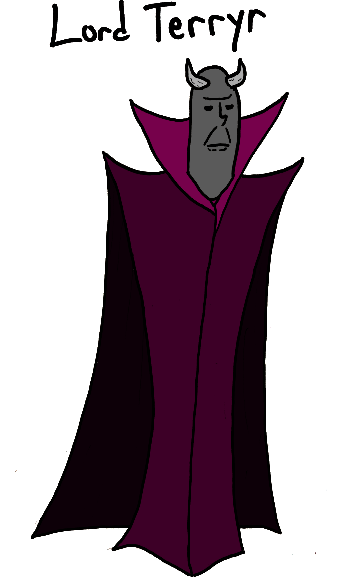 It was not intentional, but given that I’ve made him into a fearmonger who exists in space, I think he’d be an ideal enemy for Valia, the space god of courage. Natural enemies. Wielding two custom-made shotguns, the woman called Gunfire is one of the highest paid assassins in the world. Homeless as a teenager, the woman who would become Gunfire had to turn to crime. It turned out she was very good at it. 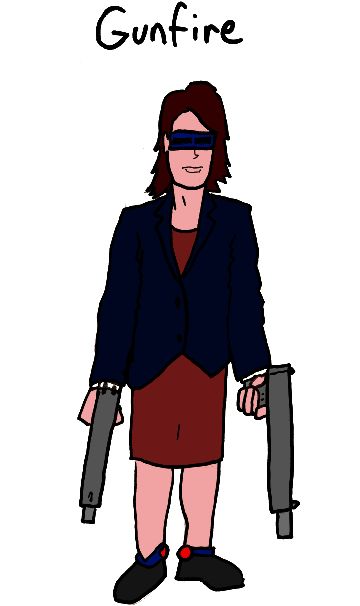 Starting as a heister, she pissed off some organized crime types when she robbed a store under their protection. When they came after her, she was able to turn the tables and brought the whole operation down. When a new syndicate moved in to fill the void, Gunfire’s reputation was more than enough to get her a job as a trigger person. Since then, her career has only gone up. As I did several times during the hero portion of Super Sunday, I’m going to be trying to stick women into roles typically filled by men. There are indeed lady assassins in comics, but they are generally sexified ninja sorts. I’m not going to say there aren’t unsexified female assassins in comics, I just think it wouldn’t hurt to have another one. 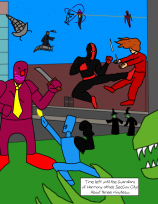 I had not intended to assign every villain I make this year to a hero I’d made in the previous year, but since I did it above, I’ll tie Gunfire here to the crime-fighting careers of Rhinoceros Woman and Rabbit. So am I pronouncing the name right when I say Lord Terrier? No, it’s pronounced like the word “gun” followed by the word “fire”.